THANK YOU! For Your Support! 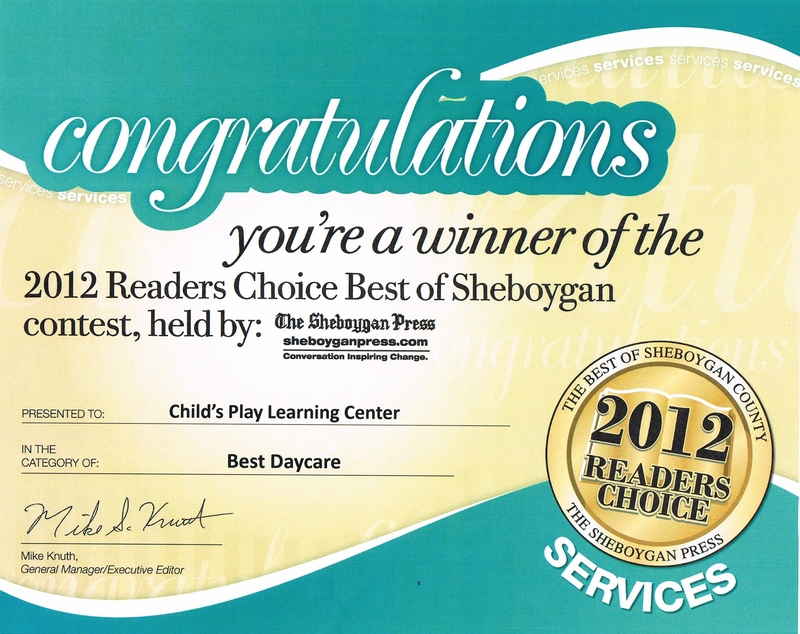 Child’s Play Learning Center Wins the 2012 Reader’s Choice Award from the Sheboygan Press – and our Families! We are thrilled and honored to have won the 2012 Reader’s Choice Award from the Sheboygan Press readers and our families. This is the 3rd time we have won this award and we know how great the competition is in our community! Thank you!!! As we start the next school year, it is wonderful to know that the people of our community recognize the educational value that we offer. We hope that you can share this great achievement with your family and friends – and help us to celebrate! It’s just about that time that some of our friends start heading back to school – or to school for the first time! Keep in mind – and spread the word – that Child’s Play has a great before and after school program. We already have buses that go to and from Lincoln-Erdmann and the Early Learning Center. We are currently in negotiations to have a bus that goes to and from Lake Country Academy. If your child/ren is planning to attend any of these schools, let us know ASAP (especially the Lake Country option). We are working with the bus company to make arrangements for the latter option and any numbers we can share with them will be helpful! The before school program starts at 6:30 a.m. and includes breakfast. After school is available until 6 p.m. and includes a snack. For 4-year-old kindergarteners, we are here for you all-day on Wednesdays. For all other school-agers, we are here for early release and all no-school days! 1. Start to work yourway back into a routine. Stabilize bed time, wake-up time and down-time. 2. Pick out a couple of new outfits to signal a transition from summer casual to more serious school time. 3. If you aren’t already, start reading (together or to yourself) every night. 4. Make a summer memory book – what were the best parts? What did you learn? 5. Talk about goals for the coming year – what is one main thing you want to learn or try? 6. Measure your height. How much have you grown since last year? Predict your number for August 2013! 7. Brainstorm lunch and school-night dinner ideas. 8. Make a supply check-list and make sure everything is labeled and ready to roll. 9. Get ready for picture day! 10. Have a So-Long Summer party – drink lemonade, make smores and run through the sprinkler. Need to Beat the Heat? Try the Manitowoc Family Aquatic Center! Miss Kim, Miss Inga and Miss Dawn will be taking their classes 30 minutes north to the Manitowoc Family Aquatic Center on August 9. This is the first time our center has taken a trip to this destination. If you haven’t taken your family, be sure to stop by and ask the teachers and thier classes about it. Several families have told us that this place is an awesome gem, especially as the summer has provided ample sun and heat this year! Let us know what you think! 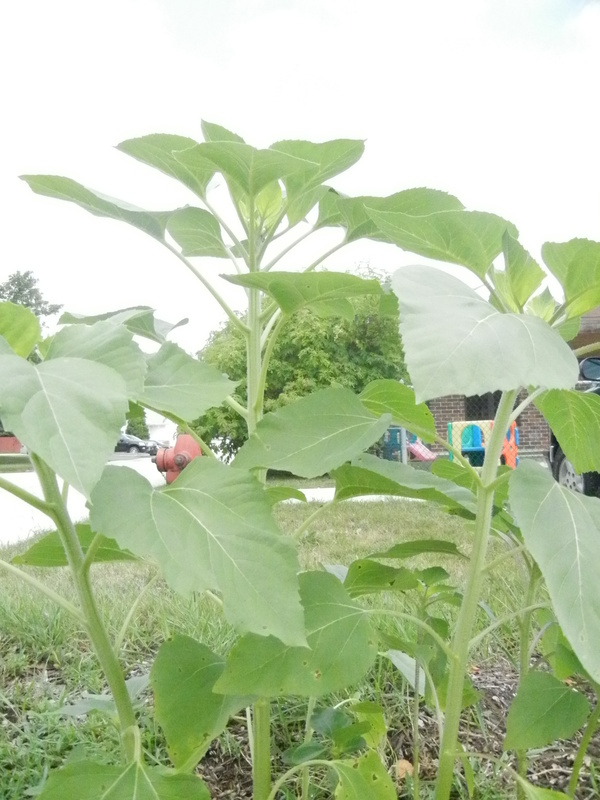 The Learning Garden has been slow to grow, but there are a couple of pretty spectacular sunflowers growing near the parking lot. Keep an eye on their progress as we move into August. They are located on the west edge of the parking lot across from the mailboxes. Please note that annual registration dues of $45 per family are due on Monday, August 13, 2012. Please plan for this annual payment and submit it with your weekly payment. Our Referral Program Is Back! As you talk with other parents, family and friends, please note that Child’s Play will give you a $60 tuition credit for every referral to our center! Now is the time when many families start thinking about care and enrichment opportunities for their children for the fall. Please share your experiences with others and grow our center family! Feel free to send people to our website: www.childsplayonsuperior.com for more information and share this newsletter! NO WAITING LISTS! Please be sure to tell your contacts that there are no waiting lists for children over the age of 2 at Child’s Play! It has come to our attention that many people in our community think that Child’s Play has a waiting list for all of our classes – and this is not true! Please help us reach out to young families in your circles of influence to let them know! End-Of-Summer Changes in Schedule – Please turn in your change of schedule forms with any back-to-school changes ASAP. End-Of-Summer Party Sign-ups – please watch your child’s classroom bulletin boards/doors for end-of-summer party sign-ups. Withdrawals and Changes in Schedule – we really need your help! Please provide 2 weeks of notice for all withdrawals and long-term changes in schedule. If you know that there will be changes in your family’s schedule, please alert us as soon as possible. Your child’s schedule impacts the staffing of our center and we appreciate any advanced notice we can get! Vacation Coupons – ALL vacation coupons must be turned in prior to your vacation or the day after an illness or a closing. We will not accept vacation coupons after the fact for expected absences. Parent Handbook – The Child’s Play Learning Center Parent Handbook has been revised and is available for your perusal. Important information about payment, illness and discipline policies is outlined for you in this one-stop document. Please click here for a PDF. Mark Your Calendars: Field Trips, Scheduling Items and More! Miss Lois became a grandma! Her family was thrilled to welcome a little girl – Harper May. Congrats Miss Vicky who was married in May! So Long Miss Ashley. Please wish her luck as she heads back to UW Stevens Point. Her last day will be August 22. Favorite thing about Child’s Play: Being able to work with family (Grandma Deb) and being so close to my kids! A quick hug in the middle of the day is the best! Favorite Holiday: Christmas – a season of giving, happiness and family! Miss Tina is one of the newer faces at Child’s Play and can be found in the office or floating around the center. 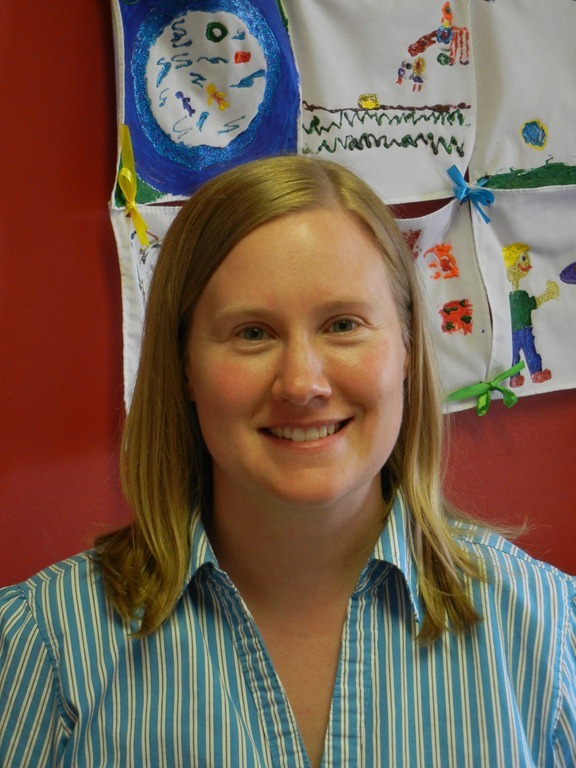 She is currently the Administrative Assistant in the office, which is good since she is an expert in multi-tasking – – – which is double-good, since she is mom to Mason (3) and twins Madelyn and Katelyn (10 months). But Miss Tina knows how this twin thing goes and can handle it pretty well, because she is a twin herself. Her brother Brian was born five minutes before her and is a whopping foot taller! Wow! Being Ms. Deb’s daughter-in-law – she is married to Ms. Deb’s oldest son Jeff – Miss Tina is thrilled to be able to work with family and to see her kids throughout the day, while putting her expertise to work. With a Doctorate in Audiology and a BS in Secondary Education, Tina brings a wide variety of experiences and a unique perspective to the center. When Miss Tina isn’t juggling the day-to-day operations at Child’s Play or spending time with her brood, she enjoys baking and cake decorating, kayaking, hiking, snuggling with her kids and helping out in the garden. She also loves dogs and cats because they also love to snuggle and have lots of personality. Speaking of snuggly, if Miss Tina could meet one person, she would love to get a few cake decorating tips from Buddy Valastro from Cake Boss. She says that he has some impressive skills and the show is fun to watch. She might even ask him to come up with something for her favorite dress-up day – Crazy Hair Day! As a parting thought, Miss Tina wants to remind every fellow parent to enjoy every minute of life because it passes by too fast, especially as our little ones grow up! Delicious! Nutritious! And Unique! Fresh from the Child’s Play Kitchen. 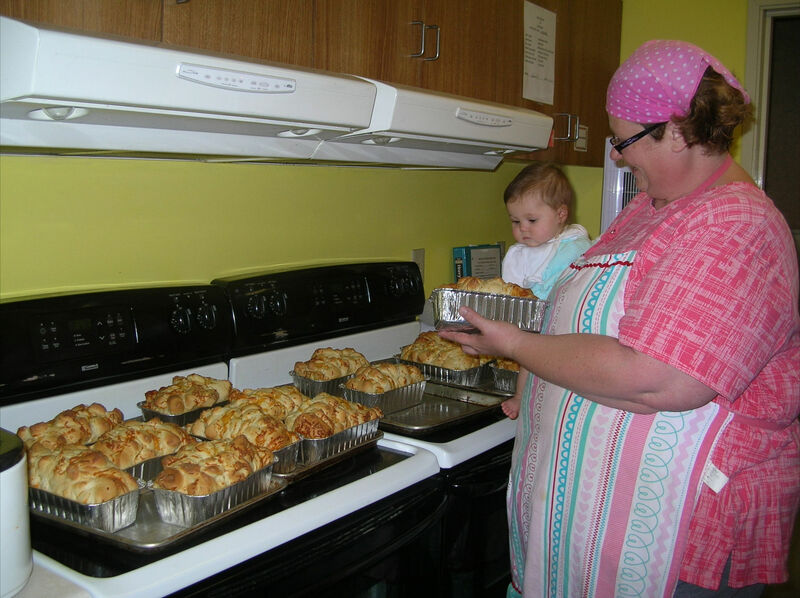 Miss Kathy shows one of our babies a batch of fresh-baked bread. The Child’s Play Kitchen is one of the most unique parts of our operation and we wanted to take some time to focus on it this month. The leadership and staff at Child’s Play are committed to providing your children with a safe and well-rounded environment. Part of this effort includes a full-service kitchen and food-service operation that supplies fresh, handmade breakfast, lunch and 2 snacks every day. As your child grows, the way we approach food, habits and traditions grows with them. From the time that they are babies through the school-age years, the nutritional and developmental needs of children change. The staff at Child’s Play is keenly aware of the impact of these habits on your child’s life-long relationship with food and we make every effort to create strong foundations and good habits. Creating well-balanced menus that combine all of the food groups in a creative way. We create everything from casseroles to sandwiches, easy finger food to more complicated recipes. Part of our goal is to expose your child to a wide variety of tastes, textures and options for a well-rounded experience. We dine together. Your child and their classmates have a daily ritual of dining together. As they grow, we create roles for them in the set-up and clean-up of each meal and snack. This ritual of dining together is part of the meal experience. We try new things. Our staff works hard to encourage children to try new things, even if it is just a taste. Many of our friends wait eagerly for mom and dad to arrive so they can announce their new experiences at the end of the day. We create opportunities to get involved. As with our Container Garden, which you can read more about later in this newsletter, we create opportunities for children to be involved in their experiences with food. We have baking and cooking projects throughout each month and create hands-on ways for your children to be a part of the process. We know that kids who are a part of the cooking and preparation of a meal, will eat it, if not try it. We celebrate with food. Our culture often celebrates by sharing food. At Child’s Play, we host holiday parties and special celebrations that encourage our children to work together to put on a party. Through family donations of food and beverages, each child has an opportunity to play a role in this traditional effort. It’s the little things that form life-long traditions in us. Have you ever considered the difference between sitting down at a table with other children, observing manners, trying new things and cleaning up versus opening a brown bag and eating the same thing day after day? This difference has life-long implications! Join us for lunch someday…as a fly on the wall…and you will see amazing things happen. Give us a call if you plan to join us so we know you are coming! Summer field trips and experiences are in full swing! 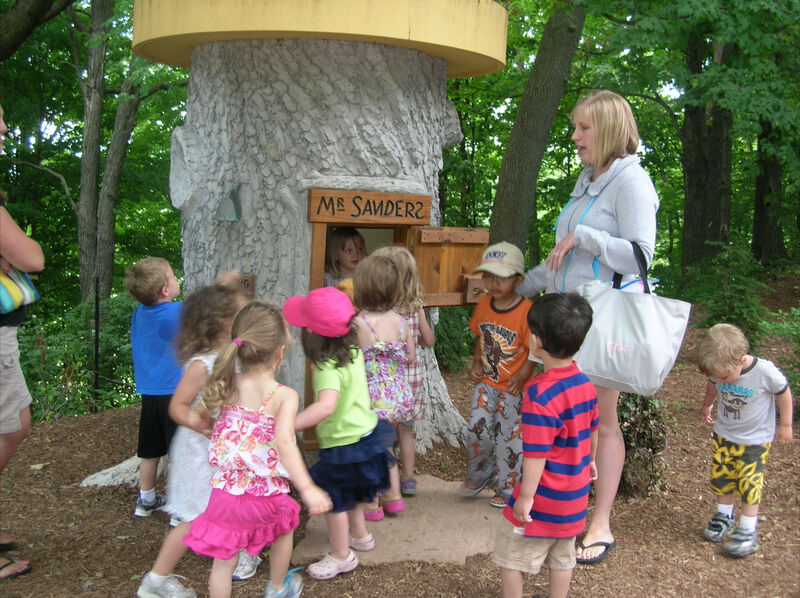 The young 3’s experienced their first field trip ever to Bookworm Gardens and found some pretty amazing things, including a view into Pooh Bear’s tree home! Many of our classes have walked to the Field of Dreams for games, playground play and baseball. Dawn & Inga’s class is headed to Terry Andrea State Park for a visit to the dunes and waterfront. Lois & Rachel’s class was one of the first groups to take a walking field trip to the re-opened Randall’s Custard a couple of blocks away. The children were able to see how custard is made and each was able to try some cool, creamy custard! And our building has even gotten a fresh coat of “paint” (water) from a couple of classes! All of the children have been a part of our Container Garden Project and we can’t wait to see how our garden grows. Check out the article below for more information. 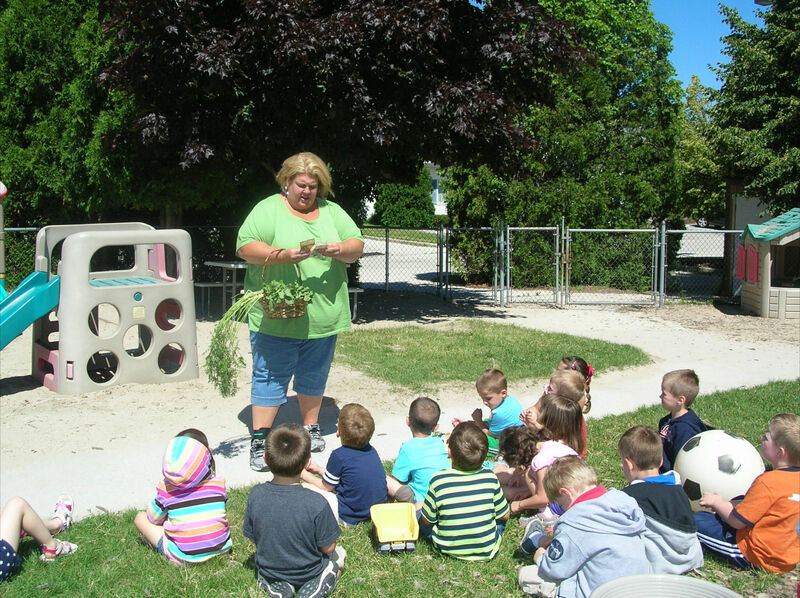 Miss Kim’s Class talks about which vegetables to plant. Our backyard play area is now home to our Container Garden where each class selected various fruits and vegetables (mostly vegetables) to grow for the summer. Every vegetable option we offered was chosen by at least one class, so we will have quite the cornucopia of produce at the end of summer. From carrots to tomatoes, peppers to corn; we have it all! We will also be adding pumpkins, watermelons and cucumbers along the fence line! As a part of this experience, the Child’s Play teachers showed the children each vegetable in its full-grown form and then taught them how to plant them into containers. Now each class will maintain their garden and wait for the harvest. At harvest time, our friends will be able to enjoy their bounty through special snacks, many prepared in the Child’s Play Kitchen! We can’t wait! It is our experience that children who play a role in every step of the selection, planting, maintenance and harvest will actually try and enjoy fruits and vegetables that they have avoided in the past. Please be sure to ask your children which vegies they selected and encourage them to report back to you on their progress! Annual Registration – The Annual Registration fee of $45 will be due the 3rd week of August. Reminders will be sent home. 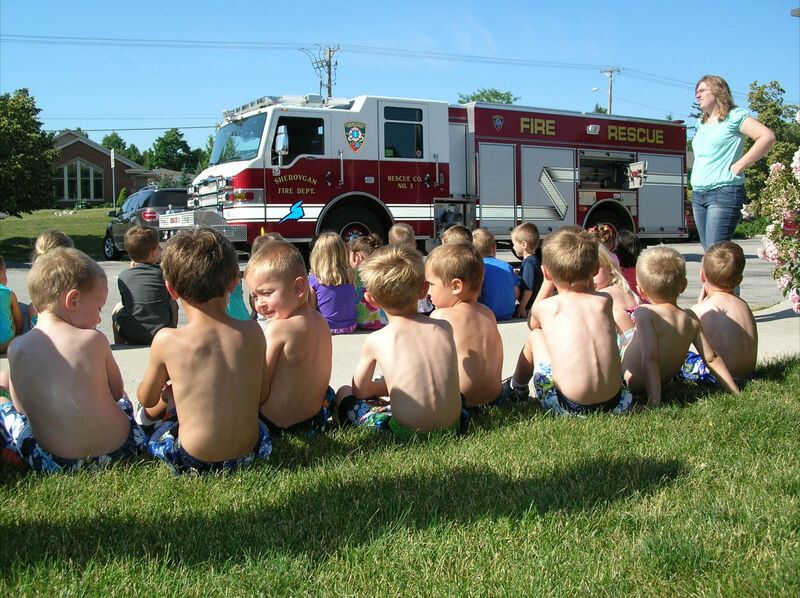 We had a visit from the Sheboygan Fire Department during swimming time, to show us a fire truck! July 4 – Happy Independence Day! The Center will be closed in observation of the holiday. July 12 – Stephanie & Tanya’s class with Dawn & Inga’s Class – Walking Field Trip to Randall’s Frozen Custard.